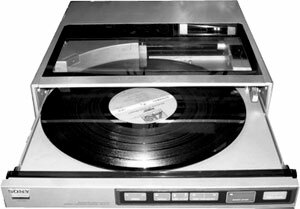 The PS-FL77 is a 2-speed, fully automatic, front loading turntable featuring a biotracer/linear tracking tonearm system. The linear tracking tonearm is designed to duplicate the movement of the head which cuts the record master. Compared with a pivoted arm, a linear tracking arm has a very small tracking error (which means greatly reduced harmonic distortion) and almost no pressure on the inside wall of the groove (which means improved tracking ability and channel separation). The horizontal and vertical movement of the tonearm on the PS-FL77 is monitored by the Biotracer's own sensors, and this information is transmitted to the tonearm by the tonearm's own linear motors to suppress resonance at low frequencies and to obtain the maximum signal to noise ratio. Sony PS-FL77 / PSFL77 owners manual, service manuals and schematics are for reference only and the Vinyl Engine bears no responsibility for errors or other inaccuracies. The PDF files are provided under strict licence. Reproduction without prior permission or for financial gain is strictly prohibited. This website is not affiliated with or sponsored by Sony.